If Einstein is right, then it’s impossible to get to Alpha Centauri in less than 4.3 years. If Newton is right, then getting there in a fraction of a human lifetime, though possible, is extremely difficult. Tsiolkovsky’s Rocket Equation tells us you would need an immense amount of propellant and an immense amount of energy to throw that propellant at high speed out the back of your ship. As in, $100 quadrillion dollars worth of antimatter per passenger. It would be much simpler if you could leave the energy and propellant source behind. But how? Enter the laser sail. Nutshell: light exerts pressure when it reflects off an object. Assemble a bunch of lasers and aim them at your ship. Turn the lasers on and they’ll accelerate your ship. Keep the lasers turned on until you reach your cruising velocity, then turn the lasers off. Your ship will coast at your cruising velocity until you reach Alpha Centauri. Problem. How do you slow down? In Avatar, ISV Venture Star carries antimatter engines to slow down on the approach to Pandora. Other powerful rocket technologies would work. By only needing to fire the engines when arriving, you cut your fuel requirement by 75%. We’ve cut the cost to a mere $25 quadrillion dollars of antimatter per passenger. Maybe there’s a cheaper way. You could use aerobraking. The ship dips into the atmosphere of a planet or other large body and uses atmospheric drag to slow down. The Motie ship in The Mote in God’s Eye dives into the atmosphere of its destinatation star. Can it work? In theory, but you’re coming in at 40,000 miles per second or faster, and missing your insertion trajectory by just a few degrees either way can send you into a fiery death (and catastrophe for the planet or star you’re impacting at 0.2c) or hurtling off into space with no chance to get back to your destination. Philip Norem’s galactic magnetic field turnaround concept. HT: Winchell Chung at http://www.projectrho.com. Back in the ‘60s, Dr. Philip Norem pointed out that if you charge your ship, the galaxy’s magnetic field will turn it. You can approach Alpha Centauri from behind. The lasers back at Earth will know when you’ll be in position, and can fire again. This time, the Earth lasers will slow you down. The only problem is if you haven’t mapped the galaxy’s magnetic field well enough, your ship wouldn’t turn onto the correct trajectory, the Earth lasers will miss, and your ship will coast into space with no chance to get back to your destination. Even if you can tune your ship’s charge to deal with unexpected galactic magnetic field strengths along your flight path, you still have to go a long way out of your way. (guesstimating from the picture to the right, 15-20 light years). Physicist and science fiction writers Dr. Robert Forward came up with another way to use Earth-based lasers to slow your ship. It requires two concentric disc mirrors stacked together, with the smaller disc on the Earth side and the larger disc on the destination side. The smaller disc needs mirrors on both sides. To decelerate at the destination, first detach the larger disc from the smaller. When the laser beam strikes the larger disc, light reflects and hits the smaller disc. This slows the smaller disc to a stop at the destination. The larger disc sails off at a fraction of light-speed into interstellar space. Robert Forward’s three-stage there and back again laser sail concept. HT: Winchell Chung at http://www.projectrho.com. And if instead of one small disc, you use a medium and a small disc, you can make a round trip. Use your laser to return the small disc to Earth while the medium disc remains at your destination. See the picture to the left. The biggest drawback is that the large (and medium) discs can only be used once. Thousands of square miles of mirrors wouldn’t be cheap. Still, it’s the best of these options. 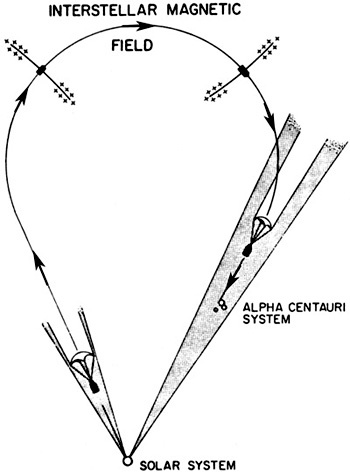 Is there any other way to slow down at Alpha Centauri? Yes. Tractor beam. (Ctrl-F for “tractor beam” after you follow the link. Huge thanks to Winchell Chung, Atomic Rockets’ proprietor, for all his work, including the three images I grabbed for this post). Wait, aren’t tractor beams as impossible as faster-than-light travel? And even if they weren’t, how much energy would it take for a tractor beam on your ship to grab Alpha Centauri or one of its planets to slow down? The answers, respectively, are no and wrong question. Tractor beams may be possible. If a light beam with carefully tuned properties hits an object, the beam can pull the object toward the light source. Or, as first envisioned by physicist Victor Veselago, surfaces with negative refractive indices (NRI) are another. If you hit an NRI surface with light, the light would exert negative pressure on the surface, pulling it closer rather than pushing it away. The laser controllers at Earth calculate the date the ship needs to start decelerating, and about 4.3 years before that date, the laser controllers fire a beam of tuned laser light that will pull the ship toward Earth, i.e., decelerate it. Just before the deceleration start date, the ship deploys an NRI sheet. Earth’s lasers fired 4.3 years ago. The laser light strikes the NRI sheet and decelerates the ship. Both tuned light and an NRI surface are used. Regardless of scenario, the result is the Earth-based laser acts as a “tractor beam” and slows down the ship at Alpha Centauri. No shipboard rockets, no aerobraking, and no galactic magnetic field surfing required. 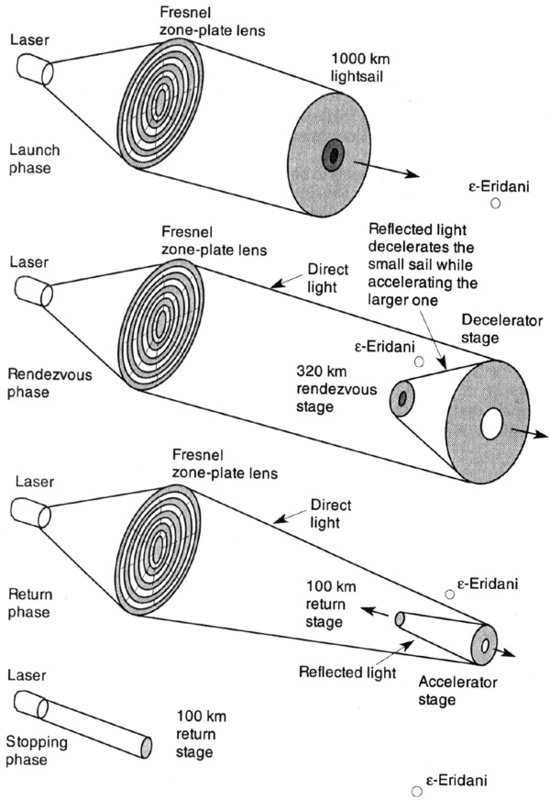 You could also use the Earth-based laser to accelerate the ship back to Earth at the end of the mission. (Of course, the ship is trusting that Earth will turn on the laser beam at the right time. But for my purposes, that’s great. Stories come from where things can go wrong). Whether the tractor beam approach is better than Dr. Forward’s multi-stage structure would come down to cost. Big throwaway mirrors may well be cheaper than giant banks of tunable lasers or big NRI sheets. 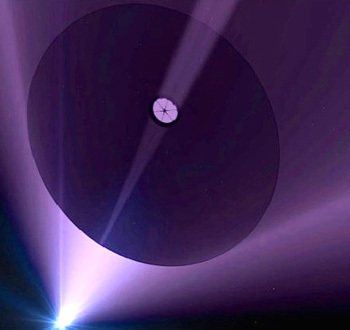 Especially because we would only need Earth-based lasers to slow our ships until the human colony at Alpha Centauri builds its own bank of lasers to decelerate incoming ships and accelerate ships back to Earth: not many missions to pay off the R&D costs for tunable lasers or NRI sheets. Even in deep space, money talks.